Dartmoor, 1900. Two friends are roaming the moors: Arthur Conan Doyle – the most famous novelist of his age – who has recently killed off his most popular creation, Sherlock Holmes; and Bertram Fletcher Robinson – Holmes aficionado and editor of the Daily Express. London, 1902. 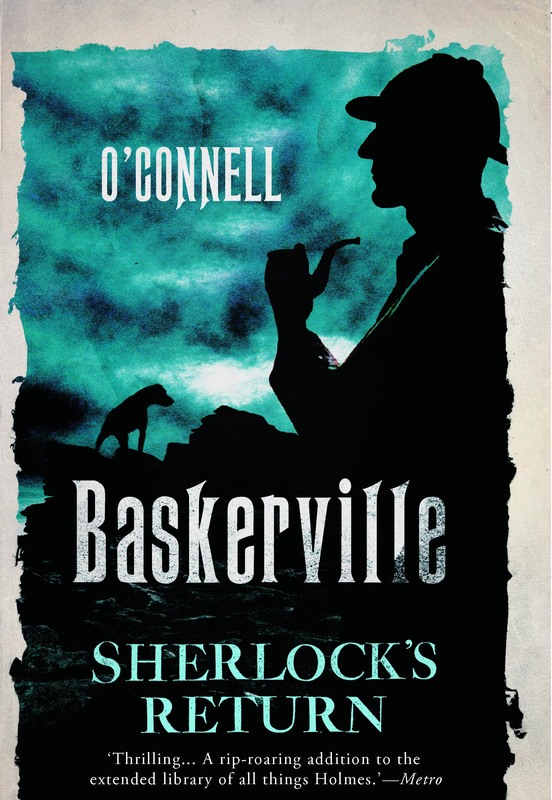 The Hound of the Baskervilles is published, featuring Sherlock Holmes back from the dead. Conan Doyle and Fletcher Robinson have not spoken for two years and the book is credited to just one author. It will become one of the most famous stories ever written. But who really wrote it? And what really happened on those moors, to drive the two friends apart? It is often hard to recall the exact circumstances of a meeting. But I can say for certain that I first met Dr Arthur Conan Doyle on the morning of July 11th, 1900. We were waiting to sail from Cape Town back to Southampton on the SS Briton, the most graceful of the Union mail steamers. Like every other available vessel, the Briton had been requisitioned as a troop transport. It had done well in the early days of the second South African war, rushing out some 1,500 soldiers in under 15 days. Now she was bringing them back; some of them, at any rate, for our fight against the Boer was far from over. As I leaned over the deck rail, straining for a better view of the gaunt Tommies waiting to board, a voice close behind startled me so that I almost lost my balance. It was a deep, confident voice lent charm by a slight Scottish accent. I turned and was confronted by its owner, a man I recognised immediately from engravings and photographs as the creator of Sherlock Holmes; though as I said, I had not met him before. I agreed that I was. But I also admitted, as I felt I must, that I had no memory of our meeting. ‘Well then,’ he said, as if that concluded the matter. Like me, Doyle is a tall man, his build stout and athletic. But he had lost weight in Bloemfontein, where he was working as voluntary supervisor at Langman’s field hospital; so much that his double-breasted linen suit billowed out in a manner it was hard not to find comical. I had noticed when we shook hands that his skin was clammy. Considering him now, more attentively, it was obvious he was unwell. Every so often a ripple passed across his pale face as if from some palsy. The weather was not yet hot – on the contrary, there was a pleasantly light morning breeze – but fat beads of perspiration glistened on his forehead. We stood there for what might have been ten minutes – not talking, just gazing at what we were shortly to leave behind: Cape Town itself, spread out along the margin of the bay; Table Mountain, whose broad, flattened summit I still longed to visit; and the whole noisy scrum of wharf life, so intoxicating when first you encountered it: Malays and Kaffirs in various states of undress, all wanting to carry your luggage to the custom-house or get you a wagon or sell you fruit – great dewy heaps of purple and white grapes, nectarines, figs, melons, apricots, all wonderfully cheap. ‘That was my first,’ I pointed out, not without pride. He stopped suddenly, gripped the deck rail and shuddered, as if a wave of nausea had overtaken him. With this Doyle turned and, using the rail for support, edged cautiously along the deck in the direction of his cabin. Doyle had a cabin to himself on the main deck. My quarters were less salubrious, though still not too badly appointed: those of us with War Office press passes were billeted in what would have been first class. About a hundred soldiers slept on the lower deck in hammocks strung up in rows. I went there only once, in a spirit of journalistic enquiry. I found the conditions cramped and stifling, rendered more unpleasant still by the want of convenience for washing. Once the anchor was drawn up we soon lost sight of Cape Town and the Cape of Good Hope. Though the sky remained clear and blue, sailing conditions worsened. A heavy beam swell rolled us around and I came close to adding my own weave to the fetid carpet I had noticed on the deck below. Evidently Doyle felt wretched as well. He postponed our dinner – first one night, then another. The monotony of shipboard life gets to everyone and I confess I grew jittery and impatient. Weary, too. Too weary to take pleasure in sights I had relished on the way out, like the shoals of flying fish and even the other passing steamers, identification of which had once been the goal of much clamorous and excited sharing of field glasses. My attempts to organise races and other athletic activities came mostly to nothing. One afternoon I persuaded several soldiers to join me in a game of deck-quoit. When their enthusiasm waned, too quickly for my liking, I passed the time reading and playing chess with a nonconformist missionary whose foul breath I had to turn my head to evade. I also wrote at length to Gladys, my fiancée, knowing I could post the letter in Las Palmas when we stopped to take on coal. I told her of my excitement at meeting Doyle. She would understand, I knew; for like me she had read with awe every Sherlock Holmes story. She shared my frustration at Doyle’s decision seven years before to kill off the great detective in ‘The Final Problem’. How can I do justice to Gladys? Let me just say that while I was away I carried in my head not merely her image – the golden ringletted hair; the light-grey eyes which seem to communicate the finest gradations of thought; the roundness and smoothness of her cheeks – but a sense-memory of her exuberant vitality. It was palpable, physical, like stray hairs left behind on a brush, or the floral smell of her neck as I stooped to kiss her. Her letters had sustained me on the front line. I loved them for their combination of domestic detail and political analysis; though I confess their naïve radicalism made me smile. Gladys styled herself a ‘New Woman’, enlightened and alert. Before I left England she had tried to persuade me to read a novel, ‘The Story of an African Farm’, which she assured me would illustrate ‘the full complexity of the African predicament’. I am afraid I put it to one side. Her letters were full of questions. How was it that a raggle-taggle band of amateur farmers could be a match for the British army? Pax Britannica was all very well, but did we really have a divine right to civilise the world? What if the world chose to resist our interventions? Still, her most recent letter, dated May 19th, had been full of the celebrations that followed the relief of Mafeking – an event of which everyone has surely heard and which I was fortunate enough to witness at close hand. Gladys was among the crowd that night. Her friends made sure of it and her letter duly reports it: proof, I think, that for all her convictions she was not immune to pomp. Four days into the voyage I received word from Doyle that he was much improved. Would I join him for dinner that evening? The first-class saloon retained its pre-war air of elegant tranquillity. Doyle arrived ten minutes late, all abustle, apologising for his poor timekeeping. He looked better, sprightlier. His eyes twinkled and his cheeks were ruddy. ‘That its antennae were long and setaceous, while its abdomen had two jointed appendages at the tip. Definitely a cockroach!’ Doyle laughed heartily. It was a wonderful sound – rich and warm. We smoked for some while, then in the dining room had a good meal of beef and potatoes; also the bottle of St Emilion I had won in Ladysmith in a card game and had been keeping for just such an occasion. Conversation was loose and amiable. It ranged across rugby football – my passion and the subject of a recent book of mine; the difficulty of digging trenches in the dry, rocky soil of the veldt; the rumours that our troops at Mafeking had survived by eating locusts and oat husks. ‘If they’re true then they shame us all,’ said Doyle, and I could only agree. ‘One afternoon I went swimming at Cape Coast Castle. The black folk jumped into the water freely enough, I didn’t see why I shouldn’t. It was only later, as I was drying myself on deck . . .’ He paused, smiling. You were never sure of the truth of Doyle’s stories. That was part of their appeal. The conditions in the hospital sounded awful. Rows of emaciated men. Flies everywhere – all over your food, forcing themselves into your mouth whenever you tried to eat or speak. Langman’s had erected its tents on a cricket pitch near the centre of Bloemfontein. The pavilion became its main ward. At one end was a stage set for a performance of ‘HMS Pinafore’. There were no coffins. Men were lowered in their blankets into shallow graves at a rate of 60 a day. It all begged the question: Why had Doyle decided to volunteer? He was a successful author, no longer in youth’s impetuous grip; no longer morally obliged to serve his country as he would have been even five years earlier. (He had sought a commission and been rejected as too old: ‘At 41! I ask you!’) Why, I asked him, had he risked his life and the happiness of his family in this fashion? There was something else, though; another factor in his desire to get away from England and follow an unfamiliar path – caring for his consumptive wife Louisa (or ‘Touie’, as he called her) had become burdensome. He sounded sincere. But I wondered, then as now, about the extent of his involvement in his wife’s care and if his loyalty to her was as profound as he claimed. More than once he mentioned a ‘very good friend’ by the name of Miss Leckie. Each time, his face flushed and his voice developed a croak so that he had to clear his throat noisily. It was via this conversational conduit that I was able, eventually, to raise the subject of Sherlock Holmes – one I had avoided as I suspected it was off-limits and did not wish to seem gauche. Doyle made a reference to this Miss Leckie’s skills at plotting, implying that she herself had helped him with some of the stories. The croak came again. I spied my opening. ‘Rodney Stone’ was a novel about boxing which, as a sportsman, I had enjoyed; though no-one would count it among its author’s greatest successes. Doyle looked pleased. His moustache twitched approvingly. The reader will not need reminding that this novel, one of Doyle’s best, unfolds on a River Nile passenger steamer. A group of tourists is attacked and abducted by a band of Dervish warriors. A silence settled over our table. Doyle drained his glass and looked about him at the other diners. Was he going to call an end to the evening? I couldn’t permit that, not yet. Doyle looked startled. ‘Holmes,’ he said, as if struggling to recall a figure from the distant past. It was an idiotic question. Looking back, I can’t believe I asked it. And yet it was answered. I woke the next morning at a quarter past five with a pounding headache. The sea had been rough in the night. Worse, my cabin-mate, Johnny Porter of the Manchester Guardian, snored like an animal. The racket woke me several times. I am not a violent man, but it was all I could do not to shake him awake and yell at him to stop. We slept fully clothed. This was uncomfortable but made for a simpler waking ritual: shaving in cold water then running 18 times around the deck to improve circulation. When I arrived at the dining room for breakfast Doyle was already there – frowning at a newspaper, a piece of cutlet grazing his moustache. I went across to him, nodding at the other diners, some of whom Doyle had introduced me to the previous night: the Duke of Norfolk and his brother Lord Edward Talbot; Lady Sarah Wilson from Mafeking; the Hon Ivor Guest. Doyle greeted me warmly and motioned for me to sit with him. I ordered a cutlet for myself and a cup of coffee: despite my constitutional I felt groggy and in need of ‘pepping up’. Doyle, on the other hand, was bursting with energy. He talked at speed, with a mouth so full it wasn’t always easy to understand him. This was a controversial area. Suspicion of the telegraph was widespread among our cadre. ‘My dear fellow,’ said Doyle, picking up on a defensiveness in my tone, ‘I’m not criticising you; merely noting that your role in such a scenario becomes not news-gathering per se but the provision of compelling eyewitness accounts. Tales of derring-do that leap off the page and read as if . . .’ He stopped, a smile forming on his lips. I felt myself flush; with embarrassment rather than anger, for Doyle had hit the nail on the head. Many such reports – of sieges, battles and conferences – were, I knew well, the invention of people who had been miles away at the time, then forced when finally they arrived on the scene to conjure drama and the illusion of immediacy from whatever was at hand: interviews with participants, survivors’ anecdotes, mess-room gossip and a good dose of pure supposition. The practice was known as ‘magic carpeting’. I had indulged in it myself more than once. Now, you will be thinking: How awful, to be put on the spot in such a fashion, and by such a colossus of creative ingenuity! But I wasn’t perturbed. On the contrary, I was confident of impressing Doyle. Since I first read his Holmes stories as a young man I’d amused myself concocting plots similar to Doyle’s, trying to match him twist for twist. You mustn’t construe it as boastful if I say I knew the sort of thing he liked. I had brought with me to Cape Town that famous monograph by Francis Galton on the subject of fingerprints, which championed the use of fingerprinting in forensic science and from which I learnt that the likelihood of two individuals having the same fingerprint is one in 64 billion. The Fingerprint Bureau at New Scotland Yard would not be created until the following year, but the practice of using fingerprinting to identify and snare criminals had been employed by the Indian police since around 1860. That it was an intriguing technology was beyond question. But it struck me as open to abuse – blatantly, hideously so. Would it not be simple to create a wax impression of a fingerprint and use it to frame an innocent party by ‘stamping’ it at a murder scene? ‘But that’s absurd,’ I said. ‘No it isn’t. It’s a wonderful idea and I want to use it. You wouldn’t want me to steal it, would you?’ He winked at me. I said I would enjoy that very much. Before I had a chance to digest what had just happened – England’s foremost writer of crime mysteries, a man I had admired from afar for many years, had thought an idea of mine good enough not merely to steal but to pay for, then suggested we collaborate – the room hushed as a figure appeared in the doorway. Doyle insisted that I come too. We followed the orderly down onto the troop deck where the hospital was located close to the bows. Inside were seven or eight bunks, all of them occupied. It was dark and intolerably hot – a cheerless place for the sick. My eyes took in the wrecked constitutions of the men before me. Two of them were clearly insane: from sunstroke, I later discovered. They twitched and gibbered, their bloodshot eyes wide with fear. Later, Doyle was good enough to tell me exactly what he did in the desperate 15 minutes that followed. For the most part I watched from a distance, knuckle in mouth, almost totally ignorant of the mechanics of the procedure. Doyle immediately took charge, as one might have expected. His fingers felt for the carotid artery in the man’s neck, for the pulse that would have signalled life. But they found nothing. Doyle instructed that the man be seated slightly upright, then undressed so that his chest was exposed. He called for surgical tools and the same orderly handed him a large canvas roll which he spread out before him on the floor. It was lined with pockets for different implements – scalpels; forceps; probes; amputation saws; a trephine; and a wooden, screw-shaped mouth gag. At this point one of the madmen started bucking in his cot and muttering about the devil having come to fetch him. I feared he would throw himself off and disturb Doyle, then saw with relief that he was strapped down with a leather belt. At the surgeon’s signal, two orderlies went across and sedated him with a hypodermic injection. Doyle took a clean rag and wiped a solution of phenol across the man’s chest before using it to clean his own hands. Its sweet, tarry smell filled the room. Then he took a scalpel and with one smooth sweep made an incision across the breastbone. There was surprisingly little blood. Next, he gained access to the chest cavity by cutting through the muscle. There was no answer. The surgeon and orderlies were too busy staring at the gaping hole in the sergeant major’s side. They jumped as one at this threat, and after much ransacking of drawers the item was found and slipped into Doyle’s now-shaking hand. Have you ever seen a human heart? I had not, nor have I seen one since that day. It is a curious thing: so small, somehow, for what it does. And this one was not at its best. I edged forward as Doyle snipped open the pericardium – the sac containing the heart and the roots of the great vessels – and saw his fingers touch the squirming mass; for squirm it did, even though the life had gone from its owner’s eyes. I saw him take the heart in his hand and squeeze it, not once but many times: firm, rhythmic compressions. It was a difficult job as the organ resisted his grasp, being so wriggly – almost as if a creature were fighting to escape from within – and there being now so much blood around the place. Minutes passed. The grim tableau remained unchanged. Doyle’s actions were having no effect. Quite suddenly, a noise emanated from deep within the man’s open mouth – a sort of hollow, gurgling rasp. It went on and on, and was most distressing to hear. I turned, seeking the source of this desperate cry. It was the orderly Doyle had rebuked. He was shaking and had gone quite pale. I expected Doyle to lose his temper; to ask what right the orderly had to issue orders to a qualified doctor. But he didn’t. He paused, as if weighing up what his next course of action should be. Then, very gently, he replaced the heart in the sergeant major’s chest and withdrew his bloody hand. I left that sorry hospital a changed man, one who had been vouchsafed a glimpse behind the too-thin veil that separates the living from the dead. Doyle had admitted this quite openly. He had implied also that he knew the sergeant major’s case to be hopeless from the start. Why, then, had he attempted the procedure, which now that it had failed seemed merely messy and invasive? Was it simply that his taste for theatricality tended towards the morbid? Or had a jaded, middle-aged man, caught between two phases of a life he demanded be packed with activity, tried a little too hard to impress me?